I get asked about weight loss and bee pollen diet pills daily. The fact is, most of the bee pollen diet pills out there are dangerous and cause many serious side effects. Our forum is filled with accounts of people who have tried these dangerous products and experienced first hand what can happen. In fact, it has recently come to light through the FDA that the most popular version of bee pollen diet pills on the market actually had the illegal drug sibutramine in it all along! As a nutritionist, I have spent years testing which weight loss products work and which don't. Below is the protocol which will deliver safe, fast, effective fat loss with no negative side effects. My Weight Loss Protocol works. But it works even faster when you follow these tips. Trust me, you can forget about all the fad dieting tips out there. There are simple, effective principles to follow that work that don't involve calorie restriction/starving yourself or "dieting." Cut out the 'white stuff.' No sugar, white rice, white pasta. Balance hormones - if you've struggled with weight loss in the past, your hormones could be out of balance. Take royal jelly and EstroSmart daily to balance hormones and reduce abdominal fat. Take 1 tablespoon of bee pollen granules 15 - 30 minutes before each meal. This balances blood sugar and helps boost your satiety or feeling of fullness. Eat 30 grams of protein within 30 minutes of waking up every day. This stimulates your metabolism for the day. Many people lose fat just following this principle alone! Don't ever go hungry. Fill up on lean proteins, fresh fruit and all the vegetables you can eat. Over the years I have seen hundreds of gimmicky weight loss pills come and go. Most of them are scams. But the ingredients that stick around because they are based on science, stick around for a reason - they work AND they are safe. 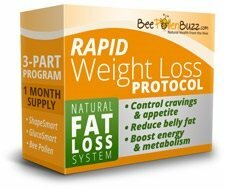 The Rapid Weight Loss Protocol is one such product. It doesn't work overnight. And its not that glamorous - there are no Hollywood stars being paid to say that they lost 80 pounds using it. You do not need to undergo an extreme juice fast or any type of caloric restriction, which as the studies have shown don't work long term. Restricting calories always leads to the regaining of the lost weight, so forget about that. These principles, when followed correctly, will not only allow you to lose body fat, but lose it for life. It is sustainable because you are eating to feel full and you are controlling blood sugar. You eat to feel full and control blood sugar by eating high protein, high fiber foods and lots of healthy fats. And you can eat a lot of these foods and still lose body fat! Take one capsule of GlucoSmart per day first thing in the morning. Take one or two packets of ShapeSmart per day for up to 10 lbs of weight loss in 60 days. Take 2 - 3 capsules of Bee Pollen pills before your two largest meals of the day.